For the best Quinton Tree Removal Company, the name to know is C.S. Flournoy. With well over 30 years of hands on experience in the industry, we know what it takes to get the job done. While others focus on getting the job done as quickly as possible, our team strives for perfection. We don't just want to meet your expectations we aim to exceed them. Taking care of this aspect of home improvement and ongoing maintenance is part of the responsibility of home ownership. Yet it is of the utmost importance to find someone trustworthy to work with to get the job done. At C.S. Flournoy we have worked hard through the decades to demonstrate to the local community here in Quinton and surrounding areas just how dedicated we are to being the best at what we do in Quinton, VA. This means our workmanship but also the customer experience. We are not satisfied with the job until you are. Contact our Tree Removal Company today to find out more about what we can do for you. Some situations call for tree removal as opposed to tree trimming. If you have a dead or dying tree you need to let us remove it before it falls and causes damage to your home. Maybe you have a tree that has grown so large the roots pose a threat to your home or plumbing. It could even be that you have an upcoming project to add on to your home or outdoor entertaining area and need more clear space. Whatever the case may be, we can help with that. We have the training, experience and skills to tackle any size job. Not to mention, we have the best equipment to get the job done swiftly and safely. If you are ready to get started on your Quinton Tree Removal, the name to call is C.S. Flournoy. The Quinton Stump Grinding technicians at C.S. Flournoy are highly trained and knowledgeable. We only hire true professionals in their field and stay up-to-date on the best options and products available. Our staff is always friendly, professional and highly communicative with our clients. 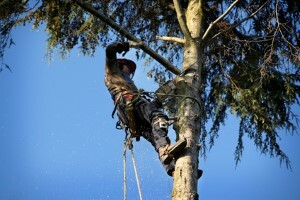 We are the team of professionals who will help let you know if you need tree trimming or removal for your individual situation. Too many companies aggressively push you into whatever job will make them the most money. But at C.S. Flournoy we are more about preserving the trees and saving you money, whenever possible. But we can't get started until you give us a call. For all of your Quinton tree removal and stump grinding needs you can count on us. Let our Quinton Tree Trimming experts show you in person how our commitment to hard work and customer satisfaction helped us earn the flawless reputation we have. If you are looking for a Quinton Tree Removal Company then please call 804-264-1000 or complete our online request form.